Posted September 7, 2018 by Miles Gopie & filed under Newswire, The Tech. Scientists at the University of Michigan have developed a solid-state electrolyte which they claim is non-combustible (which is good, because it’s heated to over 1,800° F during manufacturing!) and not vulnerable to dendrite formation due to a stabilizing ceramic layer. The electrolyte has special properties that allow for increased capacities and faster charging rates as well. Current graphite anodes have a specific capacity of 350 milliamp-hours per gram (mAh/g) and current Li-ion batteries that use them have a maximum energy density of 600 watt-hours per liter (wh/L). Theoretically, solid-state batteries can have a specific capacity of 3,800 mAh/g and energy densities of 1,200 wh/L. Also, without liquid, dendrites, filaments or combustion, charging rates can be increased without the tradeoffs of lifespan or safety. 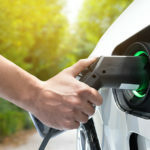 “Up until now, the rates at which you could plate lithium would mean you’d have to charge a lithium metal car battery over 20 to 50 hours (for full power). With this breakthrough, we demonstrated we can charge the battery in 3 hours or less. We’re talking a factor of 10 increase in charging speed compared to previous reports for solid-state lithium metal batteries. We’re now on par with lithium-ion cells in terms of charging rates, but with additional benefits,” says project head Professor Jeff Sakamoto. The beat goes on. In 10 years the world changes from one based on fossil fuels to one based on electrons. The ‘Anthropocene’ era will end and a new one called the ‘Electropocene’ will begin. Mother nature will rejoice. Woman will survive. Man will still be around. The way things are going, I don’t think so. Quick, send a sample to Tesla! That’s all Musk asks, rather than announcements and hyperbole.